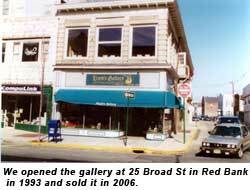 About myself - I have owned a gallery with my wife for 48 years, but sold our building in Red Bank in 2006. Now I paint from our home in Millstone. I have been an artist for over 50 years. 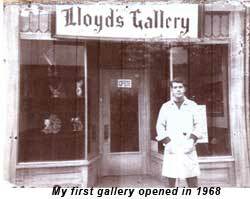 I am mostly self-taught and started my career in Rahway, New Jersey, in October of 1966. I was interested in drawing and painting ever since I could remember. The colonial paintings were inspired by the fact that I'm the 11th generation in Rahway and my ancestors were innkeepers of the Terrill Tavern (which still stands in Rahway), and also carriage and sled builders. My style is realistic, but my subject matter is unlimited. I love both a variety and a challenge. Revolutionary, Civil War, landscapes, still-lifes, portraits, Surrealism, Aviation, Nautical, Westerns, wildlife, and florals are a few of my specialities. One of my proudest moments while in the army at the of 20, I was assigned to decorate, paint murals and historical paintings for the officers club. I was invited to the club's celebration and when asked to stand up, the commanding general of Ft. Lewis, Washington, promoted me to corporal. I have painted miniature oils, two series of Christmas plates for the Bradford Exchange, and drew comic books for two years with Gold Key Comics. Some advertisements I did include the cover for "Old Spice" cologne, the logo for "Sleep Doctor," and a cover for "Finley" tea. I painted murals for Prudential Insurance in Newark, Rahway Savings Institution (Battle of Spanktown), and the restaurants Barbary Coast, Brass Bucket, and Al Dente Restaurant in Piscataway. I have painted over 20 murals; produced over 45 designs of Christmas cards, printing 5000 cards of each; and published over 20 signed and numbered prints. I worked for the FBI making drawings of crime scenes. Some of my paintings can be found in the homes of Wayne Chrebet of the New York Jets, playwright Norman Wexler of "Saturday Night Fever" - the movie, actors Buddy Hackett and Robert Mitchum. One collector has broken all of my sales records by purchasing 92 originals. Two paintings can be seen on a wall in the movie "Death Wish" starring Charles Bonson. I've also painted George Washington and his troops crossing the Delaware River for Washington Crossing State Park, and a portrait for the Sons of the Revolution organization. I have owned a gallery with my wife for 40 years. 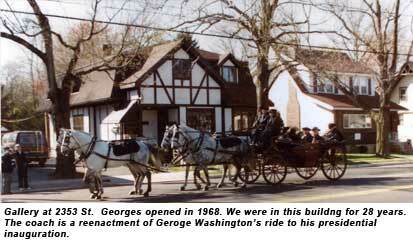 During the last 14 years we enlarged our store in Red Bank to sell gifts and antiques. What I really enjoy is to create something from a blank canvas, an image that will either make someone feel happy like my Dickens paintings, or very emotional painting like my Civil War veterans. The most important part of a painting is the idea, the spark, and the gathering of information that gives it its authenticity. Composition is next in level of importance, followed by application. It's possible to imagine ideas that no one has thought of before. People have many opinions about working artists, mostly negative. But I was very lucky to have started in the 60s and to have been a professional artists for almost 50 years. From the age of 6 years old to now there has been nothing I would rather do. If you are an actor, singer, musician, or artist you know that we love our craft and will retire only when we can no longer perform.